Head Chef Sergejs has put together a delicious Cheese Platter with fine West Coast cheeses. 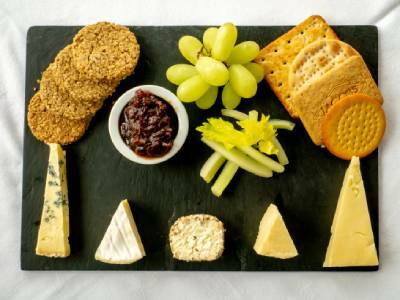 Here's the lowdown on the cheeses which are served with chutney, celery, grapes, Pierhouse oatcakes and crackers. Isle of Mull Cheddar - a hearty, full-flavoured Scottish Cheddar from just over the water on the Isle of Mull. It's drier in texture that other Cheddars with a rich, savoury flavour. Made with raw cow's milk and animal rennet. Aiket - a soft, white, mould ripened brie-style cheese which comes from Ayrshire on the West Coast of Scotland. It's made from Ayrshire cows' milk and when the cheese is young it is firm with a chalky texture and fresh mild taste. The white mould growing on the surface ripens the cheese from the outside in to the centre. As it does this, the texture becomes smoother and creamier and it develops a rich, almost mushroom, flavour. Mull of Kintyre Smoked Cheddar - an award winning cheddar crafted at Campbeltown Creamery in Kintyre. It is naturally smoked with oak chips for a deep, intense flavour. This sumptuous cheddar won gold at the 2018 British Cheese Awards and overall 'Best Scottish Cheese in Show' making it a cheeseboard highlight! Howgate Kintyre Blue - a soft and creamy blue cheese made in Campbeltown using traditional methods and ripened for two months until the delicious mild blue flavour and soft creamy texture develops. 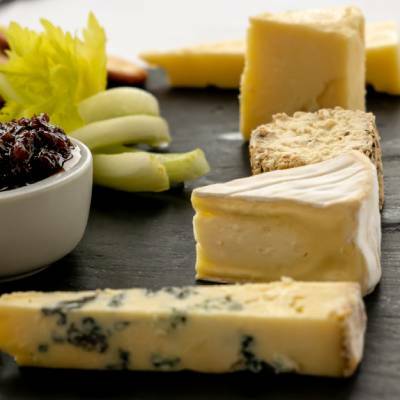 The blueing on the cheese is uniform and widespread and it gives plenty of punchy blue flavour without being too sharp. The latest addition to the Howgate family of cheeses, it has already won a Gold Medal at the Royal Highland Show. Made using pasteurised cows' milk, vegetarian rennet and salt. Clerkland Crowdie - a soft, fresh cheese without preservatives. Made by Dunlop Diary, a traditional Ayrshire cheesemaker, it is rich and creamy with a sharp tang. This is a very versatile cheese - when not taking pride of place on a cheeseboard it's ideal for topping a carrot cake, using in cheesecakes or serving with some crackers and smoked salmon.